Builders increased building activity in April to a level not seen since November 2007. Total starts increased 20.2% from March to April to a seasonally-adjusted annual rate of 1.135 million. 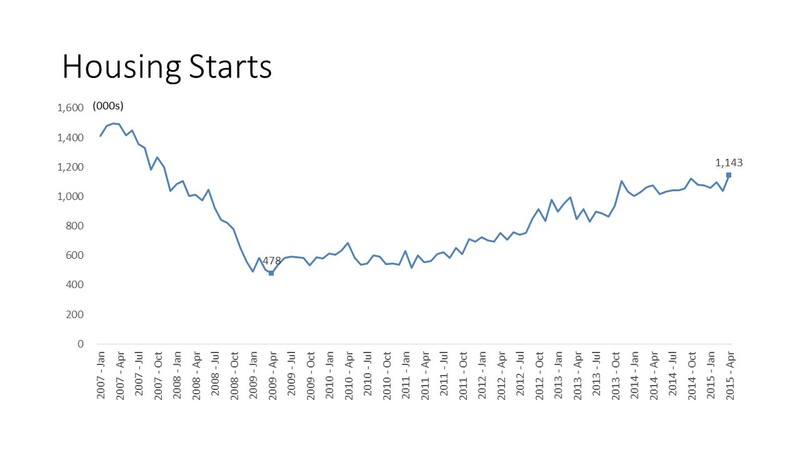 The increase was broad based with a 16.7% increase in single-family starts to a level of 733,000, the highest since January 2008, and multifamily (2 or more units in the structure) increase of 27.2% to an annual rate of 402,000. Some of the increase in the total and both sectors was due to poor readings in February and March due to particularly cold and snow-laden weather. But the increases, particularly in the single-family market, are also indicative of the continued healing taking place. Home buyers have been reluctant to buy until there is a clear sign that the economy, and more particularly their own future, is more positive. As employment grows and some wages increase and as home equity improves, some of those households break out of their concerns and are beginning to shop for a new home.